Esco is a leader in laminar flow cabinets. Since 1978, Esco has installed tens of thousands of laminar flow cabinets providing reliable protection for samples and work processes for a multitude of applications. 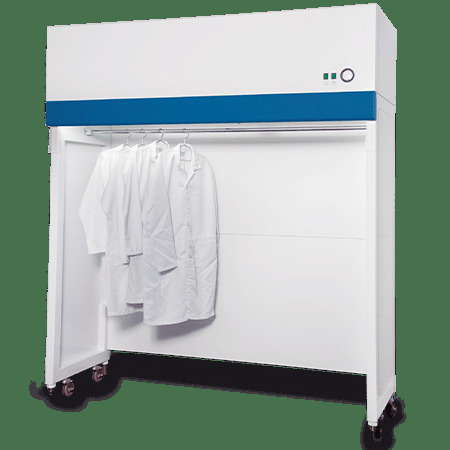 Esco laminar flow cabinets are the premium selection for the discerning user, offering a combination of value, high quality construction, low operating noise levels, and a wide product range to suit all budgets, from an industry leader. Cleanroom garments can accumulate contamination during storage and between laundry washes, which in turn may lead to lower product yields and increased product quality issues. Esco garment storage cabinets make a positive contribution to maintaining the cleanliness of a cleanroom environment. ULPA-filtered airflow keeps garments clean in storage and when being handled. Enables garments to be stored in a visible and organized manner. This small investment emphasizes to both employees and visitors that the garment they are about to don will be used to enter a controlled environment, which leads to a better awareness of cleanroom standards and operating procedures. All Esco products are manufactured for the most demanding cleanroom applications. Reliable rocker switches operate the fan and lights and a MinihelicTM pressure gauge monitors cabinet operation. Built-in warm white, electronically ballasted, 5000k lighting provides excellent illumination of the work zone and reduces operator fatigue. The reliable lighting system is zero-flicker and instant start. The main body of the cabinet is constructed of industrial-grade electrogalvanized steel. The cabinet is mobile on casters and may be fixed in place via the built-in leveling feet. All cabinet components are cleanroom compatible. Isocide eliminates 99.9% of surface bacteria within 24 hours of exposure. The enhanced filtration system on the garment storage cabinet is designed to provide the highest level of air quality within the work zone, meeting all relevant standards (see Technical Specifications for details). Esco laminar flow cabinets provide ISO Class 3 air cleanliness within the work zone as per ISO 14644.1, 100 times cleaner than the usual Class 5 classification on cabinets offered by the competition. High quality ULPA filters utilizing an improved mini-pleated separation technique to maximize surface area, improve efficiency and extend the filter life. Filters operate at a typical efficiency of >99.999% at 0.1 to 0.3 micron sizes, providing superior product protection over conventional HEPA filters.